Our office is open to the public from 8:00 AM until 5:00 PM, Monday through Friday. The goal of the Laurens County Assessors Office is to provide the people of Laurens County with a web site that is easy to use. You can search our site for a wealth of information on any property in Laurens County. The information contained herein reflects the values established in the "most current published" tax digest. *Please note that the Assessors Office establishes values only. The Laurens County Tax Commissioner should be contacted with tax bill related questions. Taken from Wilkinson County in 1807 and absorbing part of Washington County in 1811, Laurens County was named in honor of Colonel John Laurens, an aide-de-camp to General George Washington. 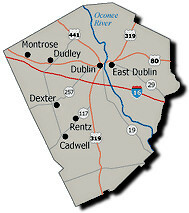 Dublin, the county seat for Laurens County, was incorporated on December 9, 1812. Dublin was named at the request of an Irishman, Jonathan Sawyer, who donated the land for the town after stipulating its name. He wanted to please his wife, who was from Dublin. The Ocute Indian Mounds at Blackshear's Ferry date back to 1000 B.C. In the Oconee River, on the Laurens County border, government biologists have discovered what seems to be a new species of fish. There are several festivals in Laurens County, the biggest is the two-week long St. Patrick's Festival in Dublin. This event includes the world's biggest Irish Stew. The county also hosts the Possum Hollow Country Fair and the Dublin Antique Fair Show and Sale. The Dublin-Laurens Museum helps to portray an active image of history in the Dublin area. For the performing arts, Dublin Theatre is one of the best in the state because of its large spacious stage. According to 2000 Census, the City of Dublin had a population of 15,857 persons. Between 1990 and 2000, the city experienced a population decrease of -2.8%, compared to the state growth during this period of 26.4%.